This gown combines a fashionable off-shoulder design with a classic strapless neckline. Delicate lace straps designed to be worn off the shoulder add a stylish, modern touch, while the boned bodice gives you bust support. The neck is cut in a shallow sweetheart, with a mid-rise back leading down to a row of lace covered buttons and a small lace train. Made of stretch jersey knit overlaid with stretch lace, this gown clings to your curves in all the right places, giving you an exaggerated hourglass silhouette – without feeling tight and uncomfortable. I normally wear a 6/8 on top 8/10 on the bottom, being a soft, stretchy lace it would fit someone smaller or curvier than myself. I'm 5'3 but was wearing 6" heels on the day. 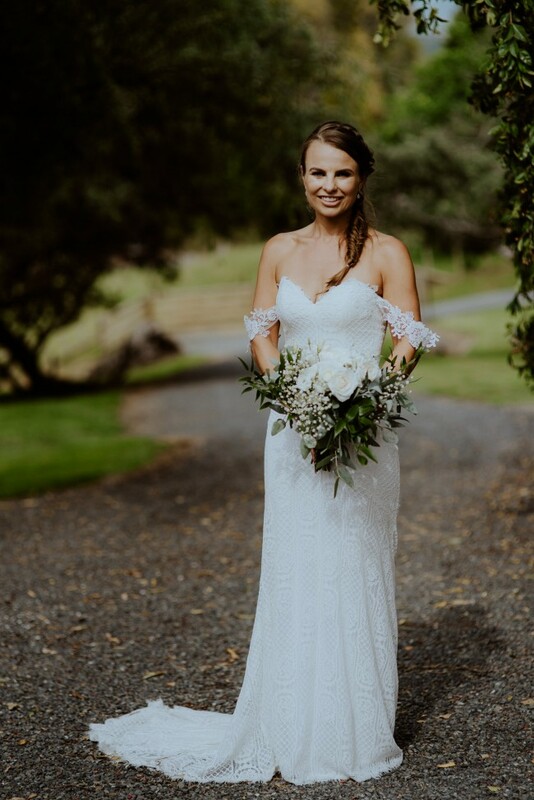 The dress will make you feel a million dollars, it's so beautiful and flattering, my guests still comment on how perfect it was. I'm so sad to be selling but hopefully it can make someone else feel as special as I did. Hem has been taken up, original lace hemline reattached. Button added so it can be hooked up at the back.